Magnetron sputtering is a highly versatile technique for the deposition of of very dense films with excellent adhesion. A type of physical vapor deposition (PVD) coating technology, magnetron sputtering is a plasma-based coating process where a magnetically confined plasma is created near the surface of a target material. Positively charged energetic ions from the plasma collide with the negatively charged target material, and atoms from the target are ejected or “sputtered”, which then deposit on a substrate. Magnetron sputtering uses a closed magnetic field to trap electrons, increasing the efficiency of the initial ionization process and creating the plasma at lower pressures, reducing both background gas incorporation in the growing film and energy losses in the sputtered atom through gas collisions. Magnetron sputtering is often chosen for the deposition of metallic and insulating coatings that have specific optical or electrical properties. Denton Vacuum has provided some of the largest early magnetron sputtering systems for large area glass coating in response to increasing demand for high-quality functional films in many diverse market sectors. We were among the first to use sputtering for biological sample preparation by eliminating energetic electrons to keep them from damaging fragile organic material, like in our Desk V “gold standard” SEM preparation series. 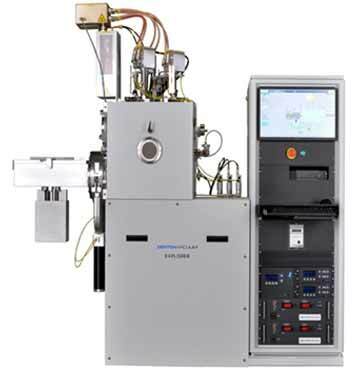 Continuing this tradition of innovation, Denton offers flexible sputtering platforms that can be configured with multiple magnetron sources. Our systems are configurable to support a variety of sputtering approaches. 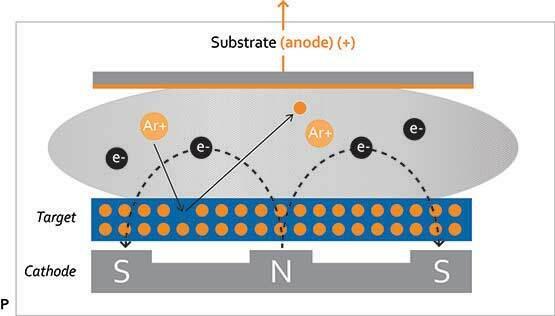 Conductive target materials, such as metals, are typically sputtered with DC power supplies. Magnetic materials, such as nickel or iron, are DC sputtered with enhanced magnet packs. Insulating target materials are reactively sputtered with either RF or Pulsed DC power delivery systems. A fully integrated Plasma Emission Monitor (PEM) system was developed to enable high-rate, controlled reactive sputtering. Denton has ongoing internal R&D programs to help advance the state-of-the art in both metallic and reactive sputtering. 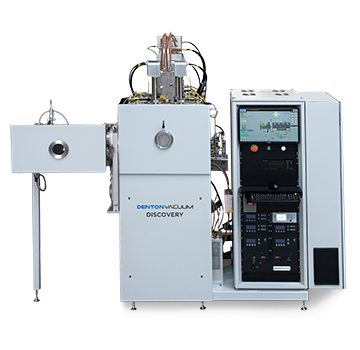 The Explorer provides the ultimate in flexibility, offering a range of configurations and deposition technologies, including e-beam evaporation, resistance evaporation, sputtering, and ion-assisted deposition. The Discovery Magnetron Sputtering system offers versatility and high-volume production capability. The system can accommodate up to 6 cathodes with triaxis adjustment. The Desktop Pro is a compact high-vacuum sputtering system that offers superior productivity using less than 36 inches (914 mm) of desk space. 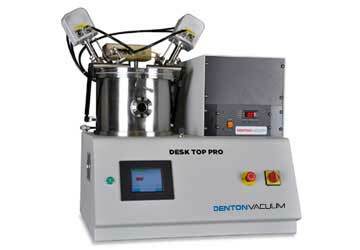 Truly versatile, the Desktop Pro can provide co-sputtering and the deposition of magnetic and/or dielectric materials.